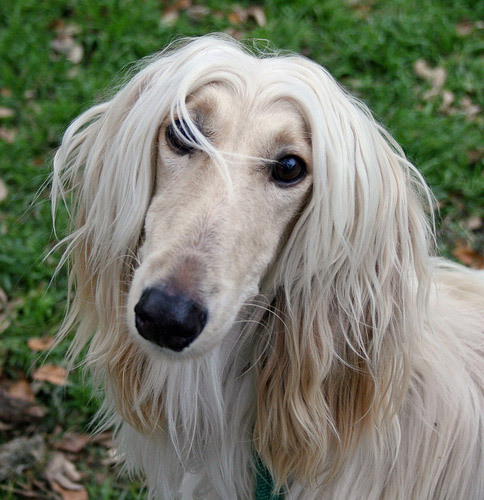 Perhaps the most elegant of the dog breeds, the Afghan Hound is definitely one of the most recognizable. Their lineage dates back thousands of years and they are the first ancient dog breed we’ll be sharing. The Afghan dogs are native to Sinai and are referenced to in Egyptian & Afghanistan accounts from over 4000 years ago. Their slender, noble nose is clearly reminiscent of Anubis himself. These animals were highly prized so their lineage was kept relatively pure and their export was highly prohibited for centuries. These handsome hounds were introduced to the western world by British soldiers in 1890 after the second Afghan war. Later in 1926 they made their way to the US, but weren’t well known until 1931 when Zeppo Marx (of the Marx Bros.) & his wife started breeding them. 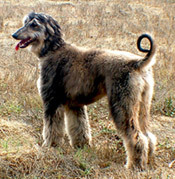 The Afghan is a sighthound and hunts by sight, they are able to bring down a variety of prey (including wolves). In their native land they are used for hunting & used by shepherds as watchdogs. Not known for their intelligence, these animals more than make up for it with their kind attitude, athletic prowess and loyalty. Their majestic demeanor makes them a popular luxury pet from Europe to America, and despite their rugged beginnings they have become the quintessential show dog. In 2005 a Korean scientist claimed to have cloned the first dog, an Afghan Hound named Snuppy. We hope you enjoyed this quick look at one of the ancient dog breeds of the world. Indeed they are beautiful animals, you might even say super model beautiful. Stay tuned, because we’ll be getting to know more of the ancient dog breeds in the coming weeks.